Your Business Reputation is Everything. An incredible 92% of your potential patrons will read online reviews of your business before deciding whether or not yours is the right business for them. 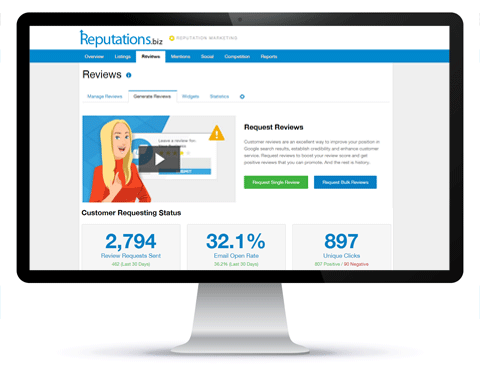 Our Reputation Marketing Platform gives you the power to maximize positive feedback that can attract additional business with favorable reviews and neutralize the negative chatter that can turn away legitimate potential clientele. In an age where “what they say” can easily transform into “who you are” – we can make your contact list an extremely powerful promotional tool. This page provides you with a summary of the online conversations people are having about your business. 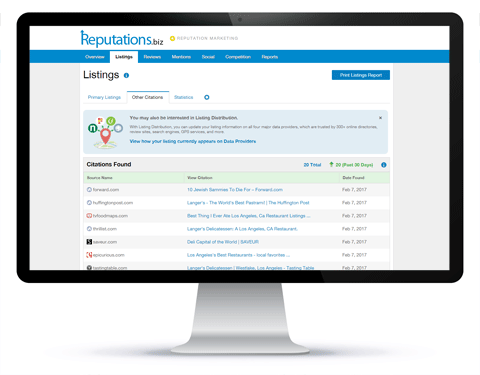 You’ll see and overview of your listings, reviews, mentions, and even how you compare with competitors in your vertical. 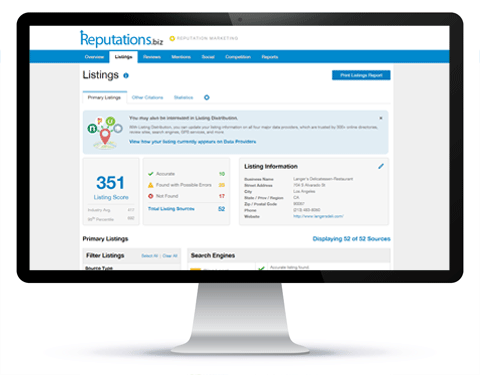 This page shows your “Business Listing Score” and a breakdown of the accuracy of your listings. The visibility of your business depends on the relevancy of your vertical’s results on major search engines like Google, Yahoo, and Bing. This page shows your visibility on these search engines as well as other review sites important to your business. This page shows your listings on smaller listing sites. 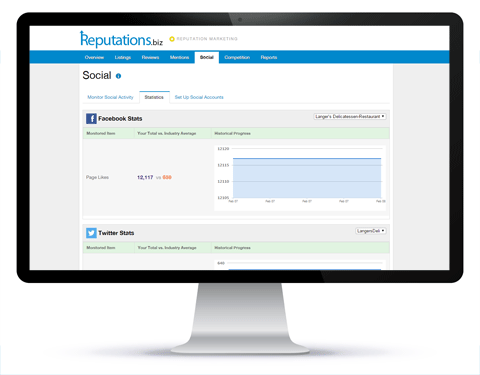 It also shows where your business is being mentioned around the web. 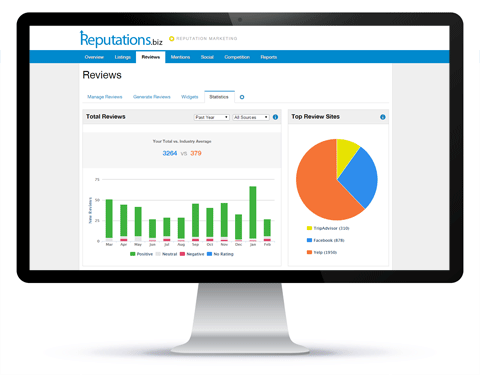 Being able to see and respond to all your reviews in an easy-to-use location is the heart and soul of your Reputation Marketing Platform. 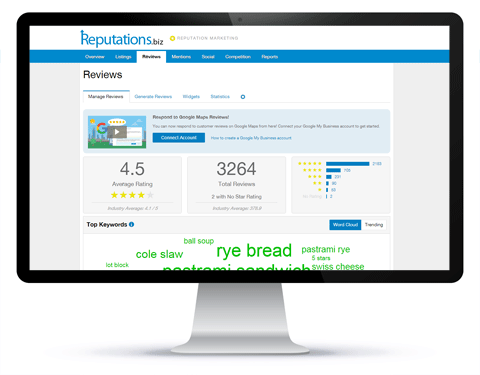 Powerful filters allow you to quickly find the reviews you’re looking for. Top keywords allow you to easily identify the products / services / employees that are being mentioned the most, and whether the sentiment is positive. Customer reviews are becoming increasingly important to the growth of small businesses. Turn your customers into promoters by easily requesting a review via email or SMS. Positive reviews are encouraged to be shared while negative reviews are escalated to your team to resolve before it is posted in a public forum. One of the many facets of great customer service is the ability to turn a negative customer experience into an opportunity to shine. Easily create a widget you can place on your website or keep open on a tablet at your place of business to encourage customers to review your business! Get easy to digest visual representations of how many reviews your business is generating, which sites they are being posted on most, your overall rating score, and even historical data for spotting trends. 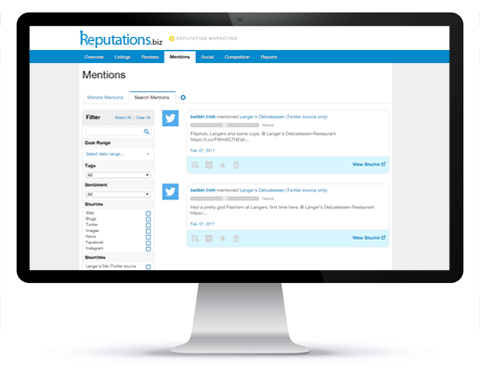 Promote positive mentions and resolve negative mentions by discovering where your business is being discussed online. 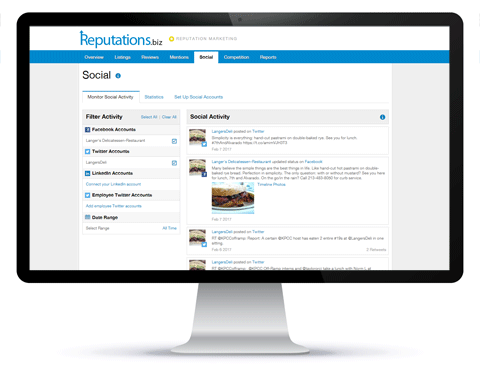 This page will show you all of your social media posts as well as social media posts that your business is tagged in. 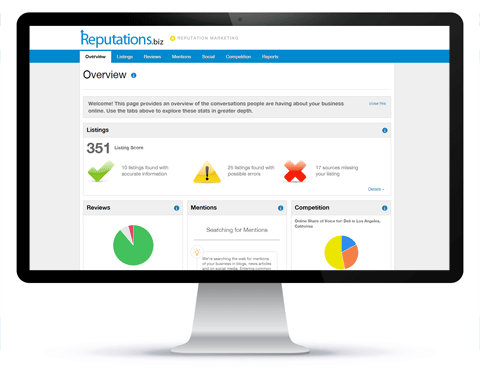 This is an incredible tool to keep on top of your online reputation. Keep an eye on your page likes and followers. See how you compare to your industry's average. 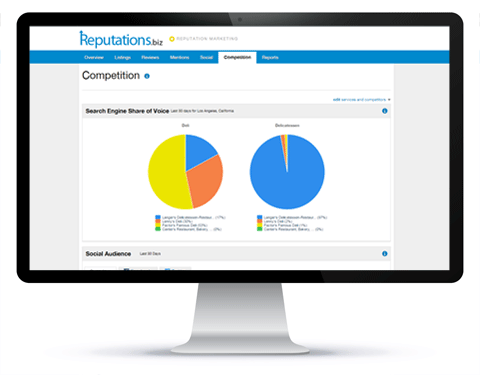 See how your business compares to its competitors online in search results and on social media. Your next customer is watching – make sure you are putting your best foot forward.